We all have dozens and even hundreds of passwords to remember. Your Mac password, like a credit card PIN number, is one of the most important, so it can be a nightmare if you forget it. But it’s not the end of the world. There are a few easy ways you can reset your Mac password and make sure you don’t lose it ever again. Secure experience is something you can’t emphasize enough while dealing with Apple devices. Hence the importance of a safe Mac password. While it could be easy to physically steal a computer, there’s little chance someone can mess with your data unless they know the password. So it’s wise to take a few precautionary measures to avoid losing it and make it easier to recover. Hope this is just a “what-if” for you, but let’s imagine it happened. You forgot Mac password and can’t access any of your accounts. There are no password hints and you can’t call it to mind, even though you’ve already tried to enter all pet names. For such cases, there’s Apple’s Recovery Mode. Turn off your computer and hold the power button + Command R. Wait for the loading bar to appear on the screen while your Mac boots to Recovery. Next, choose Disk Utility > Continue > Utilities Terminal. Type “resetpassword” (in one word) and click Return. Go to the main hard drive and choose your user account. Lastly, change Mac password, create a hint to easily recollect it in future, and click save. You’ll be able to use the new password after a restart. 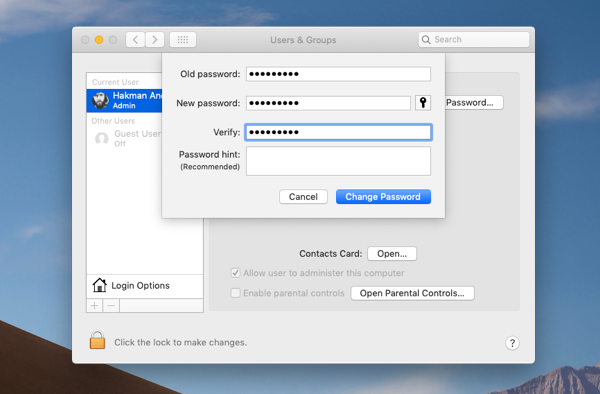 If you have an Apple ID tied to your user account on Mac, you can use it to reset password from the login window. The option should be available by default. Otherwise, you can enable it in System Preferences > Users & Groups > Allows user to reset password using Apple ID. To make a go of this, click on the question mark next to the password field that you see on the login screen. Agree to the option to reset with Apple ID and enter wrong login credentials three times to be able to create the new password. Once you get to the reset screen, input a new password two times, create a hint, and save. Reset the password for your admin account (type in a password > verify > create a hint > save). Good news: You have a new password. Bad news: You still won’t be able to log in to your account if you don’t have the Keychain password and can’t create the new one. The thing is, to unlock all the features that require Mac Password, you should be able to access the Apple’s password management system, Keychain. Unless you remember the access data, you’ll have to create the new password with an admin account. If the account you used isn’t registered as admin, you’ll have to go for the Recovery Mode option. One more important thing. 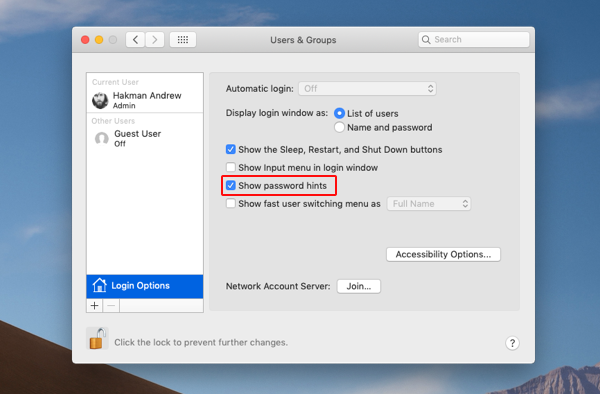 To ensure your password hint shows up when you need it, you should allow your Mac to display hints. In the Users $ Groups, click on Login options and check the box next to “Show password hints.” Ready to go. To see the hint you created, access User Groups in the System Preferences, unlock to make changes, and press Return three times. After the third time, your hint will appear right below the password field. Unless you’ve created the hint ages ago, this should help to refresh your memory. Another option is to access the hard drive of your Mac via another computer. Basically, Target Disk Mode allows you to save any data from the your Mac’s hard drive. Shut down your computer and use FireWire or Thunderbolt cable to connect another Mac. Click on the power button while holding the T button and wait for the hard drive to appear on the screen. That’s it. 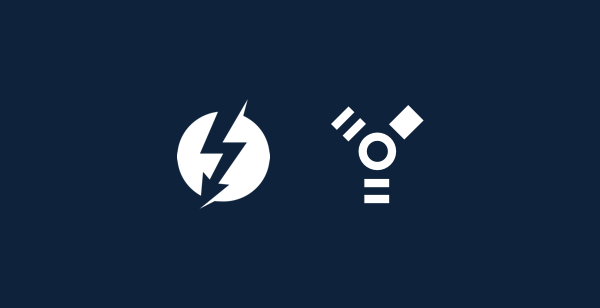 You can now easily access and recover any data from your Mac. Resetting password could make your Mac vulnerable. Particularly, Recovery Mode is kind of a security hole: If someone can get access to your computer, it’s pretty easy to boot into recovery and reset password. To prevent this from happening you should encrypt the data on your hard drive with a built-in FileVault utility. Ensure you unlock Password Reset with Disk Utility and activate FileVault on your Mac. 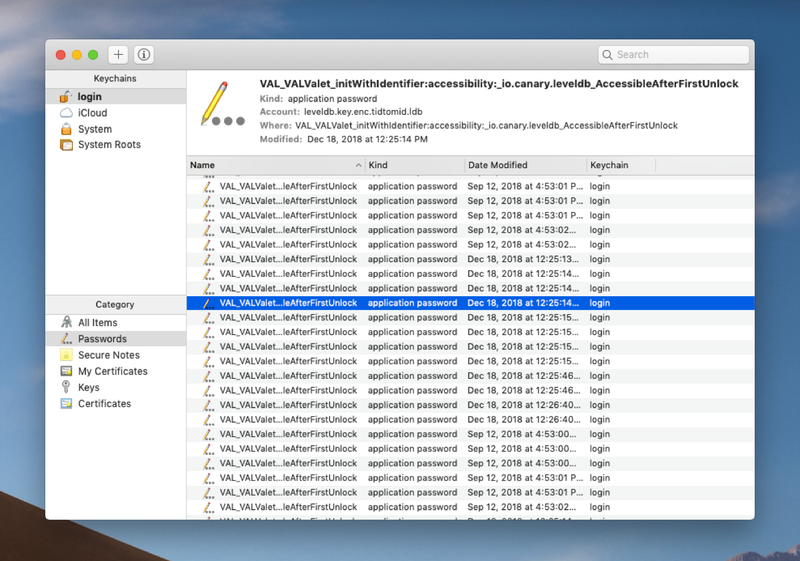 In case you’ve lost one of your internet logins or don’t remember the password to your WiFi, it’s very likely that you can recover it using your Mac’s native password manager — Keychain Access. 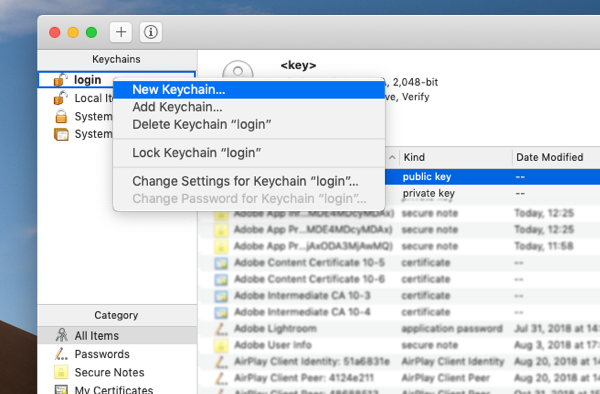 Although Keychain Access can be very useful in finding passwords you thought were lost forever, it’s rarely used intentionally due to its clunky interface and messy save-all password behavior. However, using a password manager nowadays in general is a must. And if you have to start somewhere, look no further than Secrets. Secrets is a simple but robust password manager that can become your central point of reference when looking for passwords, WiFi passcodes, secure notes, credit card numbers, and other personal information. The app is supported by the industry-standard PGP encryption so none of your files will ever get exposed. And no, saving your passwords in the Notes app or on paper is not a good idea. Thankfully, Secrets is very easy to use. Additionally, Secrets has an importing feature where you can download all your existing passwords from other managers or even as a simple .csv file. And moving forward, Secrets can be populated through a handy browser extension with a quick built-in password generator. Taking all the necessary measures to stay safe online is a must. This includes having good password hints for your Mac, knowing how to navigate through the Recovery Mode, and of course using a good password manager like Secrets, which is available for a free trial through Setapp, a platform of over 120 best Mac utilities that can help you out in just about any scenario.